Choi See-joong, former chairman of the Korea Communications Commission and an aide to President Lee Myung-bak, was sentenced to two-and-a-half years in prison and a fine of 600 million won ($537,000) Friday for accepting bribes from real estate developer Picity in return for influence peddling. The Seoul Central District Court rejected a request from the 75-year-old for bail. “Choi was a politically and socially influential figure at the time of taking the kickbacks, and he was supposed to be an exemplary figure of respect to people. But he received a large sum of money from a specific company that sought to use his power for business favors,” judge Jeong Seon-jae said. “A prison term is unavoidable even though we take into consideration that he actually didn’t help the developer’s business and his health is not good,” he said. It was a lighter punishment than the prosecution had sought _ a three-and-a-half-year prison term and an 800-million-won fine. Choi, who is considered to be a mentor to President Lee, was arrested in May on charges of taking 800 million won over 13 occasions from Picity head Lee Jeong-bae, who sought Choi’s influence for quick and easy processing of administrative affairs, through a middleman between July 2006 and February 2008. “Choi claims the 600 million was financial support for a press forum he was operating, unrelated to influence peddling for the development project. But we can’t accept the claim because the Picity chief was not close enough to him to donate such a large sum of money,” the judge said. But on the 200 million won the middleman claimed he offered to Choi, the court didn’t acknowledge it, citing lack of evidence. 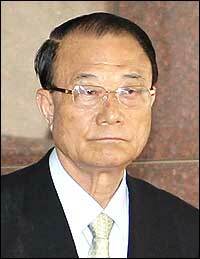 Choi also had admitted to receiving 600 million won, but not the 200 million won. Choi asked for bail for health reasons, but the court denied him, saying he was likely to flee or destroy evidence. Choi stepped down as KCC chief in January, after one of his close aides was accused of receiving large amounts of bribery money. In the meantime, prosecutors recently sought three years in prison for former Knowledge Economy Vice Minister Park Young-june, who was indicted for charges similar to those Choi was convicted for. Former Seoul City official Kang Cheol-won, also accused of the same charge, was put behind bars after the court sentenced him to 10 months.